The story: This kitchen was challenging because we had been asked to put the new kitchen into the basement and the basement needed some care and attention before we could create anything interesting. We put in a new suspended ceiling, which removed some strange boxed in bits from view, raised the height of the lintel across the chimney to create space for a cooker, cleaned the exposed brickwork which we really liked and reused the existing oak floor to keep the cost down. The paint colours and lighting were really important elements to get spot on, as the natural light was not bad but was a bit limited. Our clients wanted their new kitchen to be re-sited in their basement. This would enable them to have a fabulous sitting room on the ground floor with high ceilings and strong period features. They were also keen to have an island, which they felt would add to the practicality and sociability of the kitchen. In addition, budget was another driving factor. We were asked to mastermind the complete job, as they both work, and dealing with one company would make the contract considerably more straightforward to manage. We designed the complete basement area to make sure that the plan to have the kitchen here really worked. It became evident that existing tall cupboards could be repainted and used to conceal the boiler and to supplement the storage space for dry goods. The access to the garden at the back of the house was not impeded by the space required for our client’s dining table. The basement had been a bit neglected and we needed to improve things. We produced a plan and a costing on the building works that were anticipated to allow us to deliver on our kitchen design. In order to bring an island into the design we had to use the chimneybreast as a site for the cooker. We kept the cost down by carefully managing the project, minimising waste and by producing a plan that would be relatively simple to execute. For a basement this was a pretty light space but it was evident that a light worksurface would only help the design. The painted cabinetry seemed a natural choice given that the oak floor was going to be used again. We managed to keep some of the original exposed brickwork on each side of the chimneybreast and this became a really important feature. Q) Was there any renovation work involved? Yes, nothing difficult but the building work was quite extensive in order to reach a clean, flat, tidy, decorated ‘shell’ to fit our kitchen into. A suspended ceiling concealed some steelwork. Putting in a raised lintel in the chimney enabled us to place a range cooker into the chimneybreast. The oak floor was a mess so this was removed, cleaned and re-laid with a whitening compound in the finish. The brickwork was pointed with a lime-based putty to keep it light and authentic. Q) What design elements do you think make the scheme so successful? If you look at the window behind the island, you can see it is flanked by two shallow, partly open cupboards. Originally these were bookcases that would not have worked in a kitchen. This was one of a number of details that raised the finish look of this very bespoke kitchen. Other details that worked well were the rounded mantelpiece over the range cooker. You would never think that this enabled us to fit extraction, ducted to the outside. This roundness was echoed in the rounded columns and curved skirting to each side of the range cooker. The glass splashback retained the theme of keeping it simple. Lighting plays an important role here with attention given to a mix of task and softer lighting. 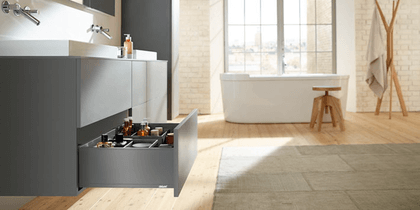 Tricky question – every kitchen has to be planned individually. Every client has different priorities. Perhaps the most important advice is to develop a strong mental picture of the final room. Signing off colours and textures and materials is quite a good place to start. We also love seeing clients checking the details such as capacity of storage space for refrigerated and dry foods, size of pan drawers and the number of drawers that will be needed. Time spent on exploring and questioning the correct blend of cooking appliances is also well spent. We recommend a steam oven over a microwave just from experience but clients need to cook and use the latest appliances before making a commitment themselves. I think space is hard to envisage and a good designer should be able to properly sign this off. This is particularly important in a smaller kitchen.